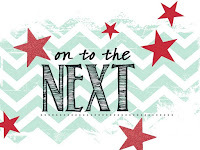 #stampinup #faithfulinkspirations #creationstation Happy New Year!! 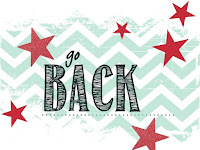 I'm excited to work with all of Stampin' Up's new goodies in the Occasions and Sale-a-Bration catalogs. I think I've already ordered half of everthing that's in the Occasions catalog--and that means I've already earned a bunch of SAB sets! Yay, me! You, too, can earn a SAB with every $50 you spend during Sale-a-Bration. Contact me today for more details!! 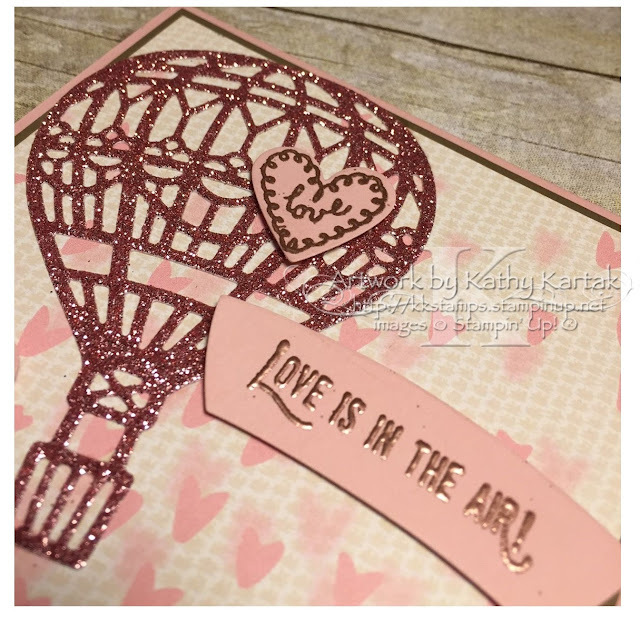 Our theme for the January 2017 Creation Station blog hop is "Love is in the Air, Love is Everywhere!" It's not just about Valentine's Day, which is great, because I needed to make a card for a wedding next weekend. I wasn't sure what I was going to do for quite a while and then it just hit me. Does that every happen to you? Do you mull something over for a few days and then get the answer light a bolt of lightning? It doesn't always happen that way, but I'm always pleased when it does. And I'm super pleased that my lightning bolt turned out just like I imagined it would!! I knew I was going to use the "Lift Me Up" bundle (item 144712) because one of the stamps says "Love is in the Air." That was a no-brainer! But I wanted to do something different than the many wonderful samples I've already seen. Here's what I came up with. I cut out the large balloon from Blushing Bride Glimmer Paper using the Up & Away Thinlits Dies. I stamped the hearts in Versamark Ink onto Blushing Bride Card Stock and then added some Copper Stampin' Emboss Powder and used my Heat Tool to emboss them. I also used Copper for the sentiment. Did you notice the banner? It's one of the Up & Away Thinlits--meant to be part of a larger balloon. I thought that was clever! I like it so much I'm going to use it again and again! 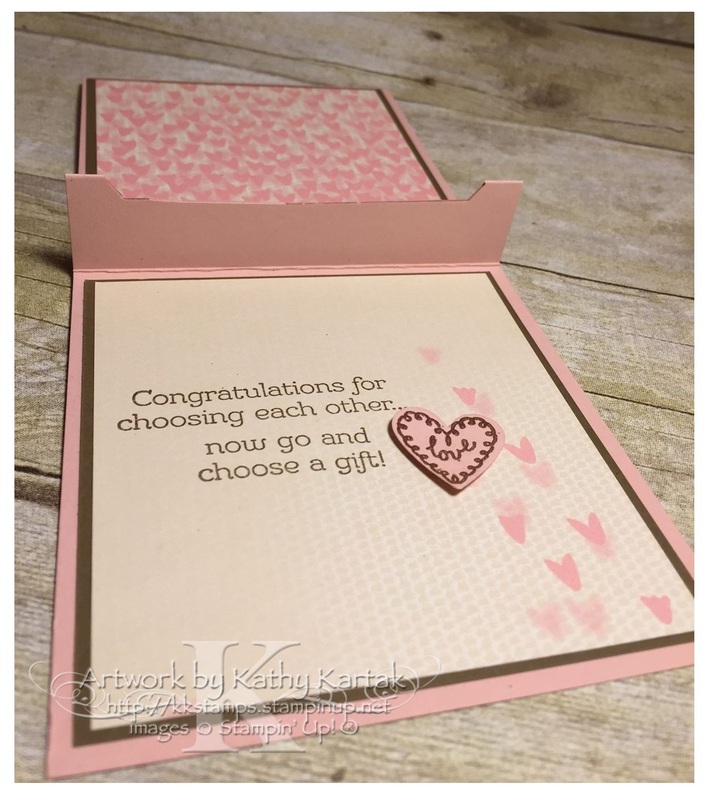 Here's the inside of the card--it's a pop-up gift card holder! Doesn't the Falling In Love Designer Series Paper look great on a Soft Suede Mat? 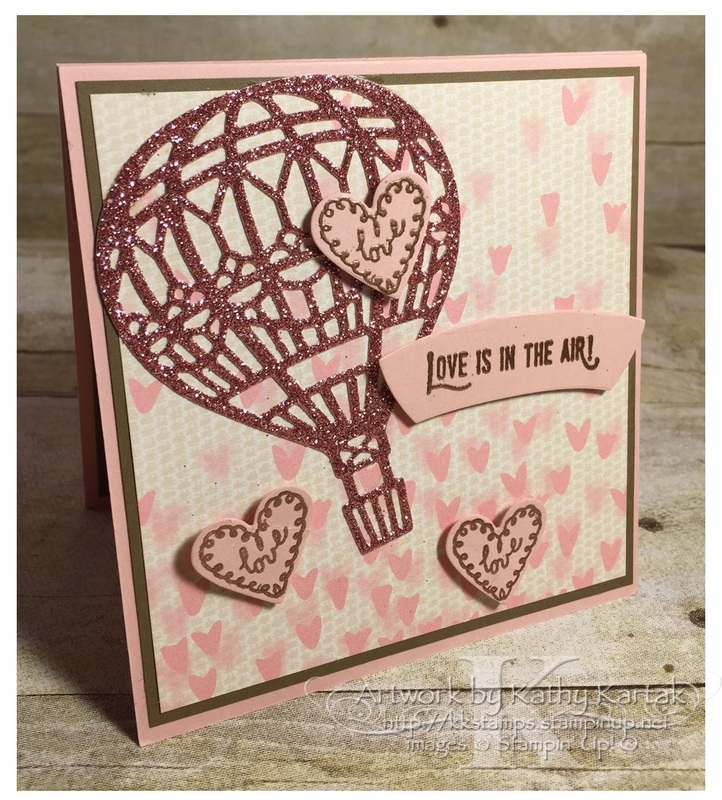 The sentiment is from the "B.Y.O.P" stamp set and is stamped in Soft Suede right on the DSP. I added another copper-embossed heart to the inside because they're so dang cute! The finished card is 4-1/4" by 4-1/2" so I needed to make an envelope for it. 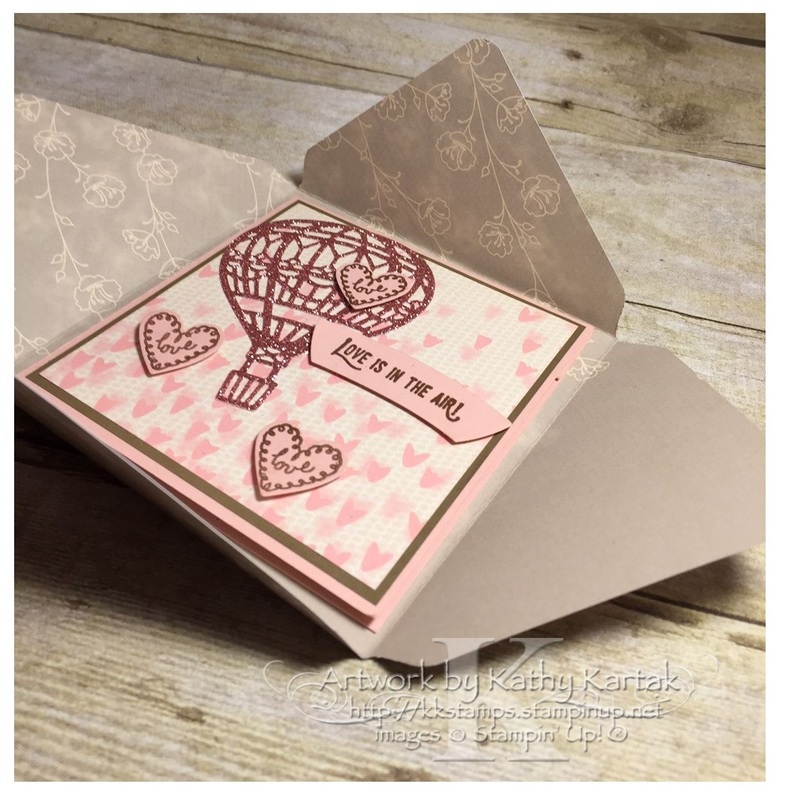 I used my Envelop Punch Board to make the envelope out of another another sheet of the Falling in Love DSP. 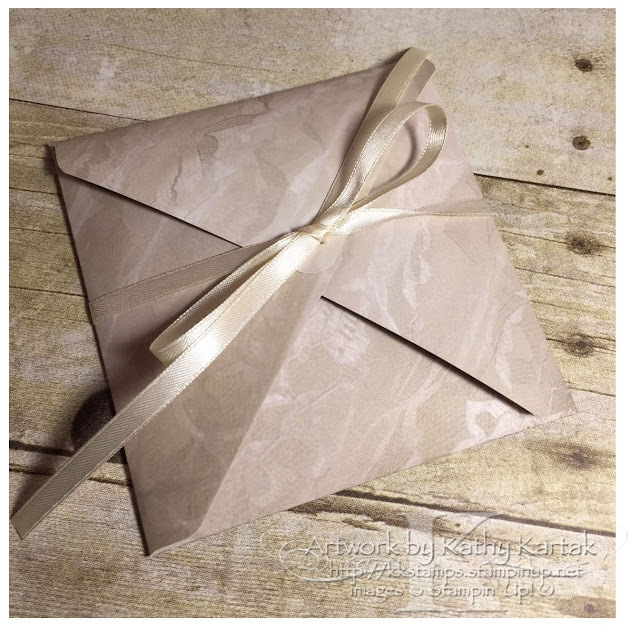 Instead of gluing the flaps and making an actual envelope, I just wrapped the card in the pretty paper and tied a length of Very Vanilla 1/4" Satin Ribbon so that the packaging for the gift card is a sweet little gift itself! I hope you enjoyed my LOVEly creation this month. Now it's time for you to hop around and see what the rest of the artists on our design team have made for you.